Newport County's season could be defined by their results between now and the end of January, says manager Michael Flynn. 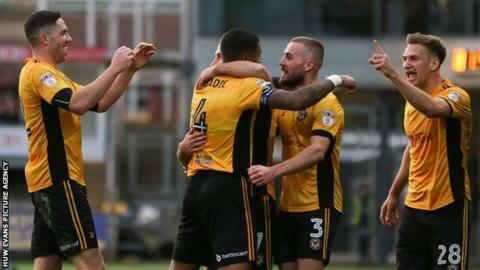 The Exiles are two points outside the top seven in League Two and face a run of games against teams around them in the table, starting at home to Carlisle on Saturday. "It is a huge two months," Flynn told BBC Sport Wales. "The end of January will give us a rough reflection of where we are." And he added: "If we go and win eight in a row then we're going to be in some position, but if we go and lose eight in a row it will be difficult." A year ago Newport were bottom of the Football League and in the middle of an eight-match losing run. After remarkably saving their League Two status in the final game of last season, Exiles have become unlikely promotion contenders this term. "We've got a tough period now," said Flynn. "We have six league games [against teams] all there or thereabouts around the play-offs and it's a test of our character and our ability. "You look at it we've got Carlisle, Cambridge, Lincoln, Wycombe and then Cheltenham away isn't too far off. "Then we've got Exeter so all of them are easily around about the play-offs so it's a tough run." The club have also got an FA Cup third round date with Leeds to look forward to in January, but Flynn has banned talk of that game until after the festive period as they look to consolidate their position in the table. "I'd much rather be in this position now than where we were this time last year," he said.